Office, Warehouse, Garage Space.... Just off I=70 at the Benton Curve! Former Watkins Brother Funeral Home, Built in 1930 by heron Watkins (1877-1950), or T.B. Watkins, a prominent African American of Kansas City and father of local politician Bruce R. Watkins. Watkins was born near Indianapolis and came to Kansas City in 1909 as an undertaker and soon co-founder of Watkins Brothers Funeral Home at 1729 Lydia Avenue, later relocated to the new building at 2800 E. 18th St.
Two story office building with freight elevator and basement. Large meeting room, numerous offices, large parking lot and a 7 car garage! Located next door to Metropolitan Community College at the corner of 18th and Benton! Located east of 18th & Vine on the corner of 18th & Benton. 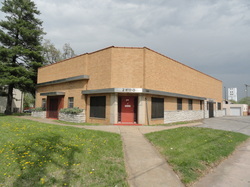 Its central location provides great access to the metro area via Bruce R. Watkins and Interstates 35 and 70. Metro Bust Stop located in front of the building!